Eight years ago in Om Hospital at Kathmandu, the first test-tube baby of Nepal was born. Today the number of test-tube babies has reached over 300 from 60 batches. Dr. Bhola Rijal, Chairperson of Om Hospital said, “The infertile parents from USA, Germany, France, Brunei, Italy, and HongKong have also come to Nepal for test-tube babies because Nepal got the highest success rate in IVF and is comparatively cheaper here than outside”. “The couples who had done IVF in third countries and got negative results are also coming here because of our high success rate”, said Dr. Rijal. IVF stands for In-vitro Fertilisation, a process in which egg cells are fertilized by sperm outside the womb. This process involves hormonally controlling the ovulatory process, removing ova (eggs) from the woman’s ovaries and allowing sperms to fertilize them in a fluid medium. The resulting fertilized egg is placed in the woman’s uterus for further development of the fetus. What is the cost for a test-tube baby in Nepal? It costs about NRs. 300,000 – 350,000 or $2815 – $3285 (USD) in the hospital, and to get a healthy test-tube in Nepal is almost sure. She recalls that Om was named by her mother both for the religious significance of the word and the recognization of the effort put in by Om Hospital. Today Om studies in Class II at St. Xavier’s School and is brilliant in his studies and extracurricular activities. “He is perfectly normal and healthy kid”, said Sandhya wondering how people could think that he is different from others. Dr. Sushil Koirala, director of National Dental Hospital, was the first father to have twin test-tube babies on April 3, 2005, in the country’s history. He had gone for IVF technology after the couple could not conceive for more than 11 years. 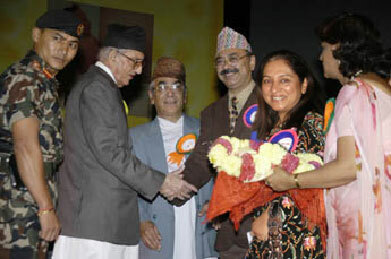 Koirala says, “Although we tried for a test tube baby in India, it was not successful”. He added that they stayed in Banglore for three months. “When I heard that Om hospital was providing IVF technology, we returned to Nepal with hopes. And it actually worked and today I am a proud father of Yugottam and Yugeshwor.”Both of them are studying at the Kasthamandap School, Mandikhatar in Class II. He said both of them are normal and as healthy as other children. I feel proud to say, Nepal marks 7 years of successful IVF Technology, which also stands as a beacon of hope for those couples struggling to conceive on their own. Nepal is really doing Test-Tube Miracles and helping the couples from all over the world. “I feel proud to be the son of mother Nepal, a piece of heaven and the birthplace of Lord Buddha where people live in brotherhood and sisterhood.” – Rabins Sharma Lamichhane. five years became.we are unable to get a baby.My wife´S follopian tub has blocked.pls help me. Please, can your share or location so that I can suggest you accordingly. In during the treatment procedure please never consume any meat, fishes, etc as they are some of the factors causing fallopian tube blockage (affect the estrogen). Carrots and Zucchini help to improve the condition. And take vitamin C riched diets. Consult your family doctor if not can you share your location with me. I can help you anything possible.